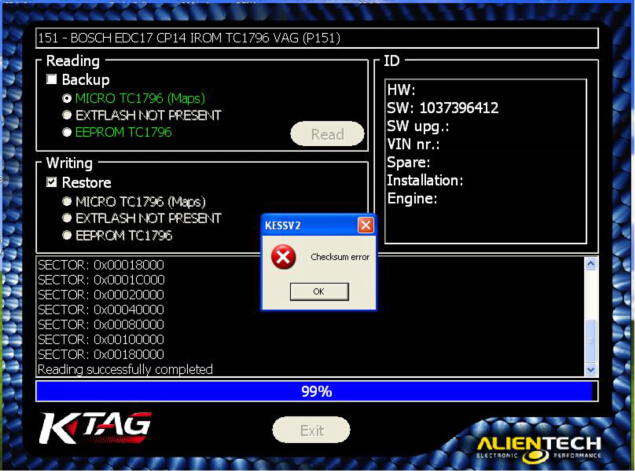 Test report of Kess V2/Ktag for checksum correction, help you to get a decent tool to do checksums. My Ktag Clone was 6.070 and Updated few Months ago in EU and Rework the PCB Complete. I have teste Ktag 7.020 on several F-series. I was battling with an MSS60. According to this ECU, you must do a full read and then straight after that you must do a full write. After you've done that, the ECU is open for you to load your tunes based on partial reads and writes. The reason for the full read and full write is that it takes off the tuning protection on the ECU. I did a full read a month ago, and only did a full write a week ago. Whenever I tried to write the tune file, the ECU would be bricked and come back with a checksum error after the write. So the secret is to do the write directly after the read. I did this with a Galletto but the process is the same for Kess. I now write my custom tunes with Kess to the ECU, and KSuite corrects the checksums for the partial writes. The process is different for other ECUs I'd imagine. Vw edc 17 Cp14: NO! I used to have problem with checksum in latest sagem3000. i have genuine full KTAG , i confirm that has many problems to. Tested on edc17cp14 vag , will fail to correct checksum. Every time, when you run k-tag k-suite software, read the ecu information, and then show "checksum error", the k-suite software is shut down. – download from alientech website ksiute 1.85 -> install it, it will install C++ automatically -> remove dir C:KSiute -> Replace it with KSiute dir which You get from Your clone supplier -> restart WIN -> be happy with Your master ktag.